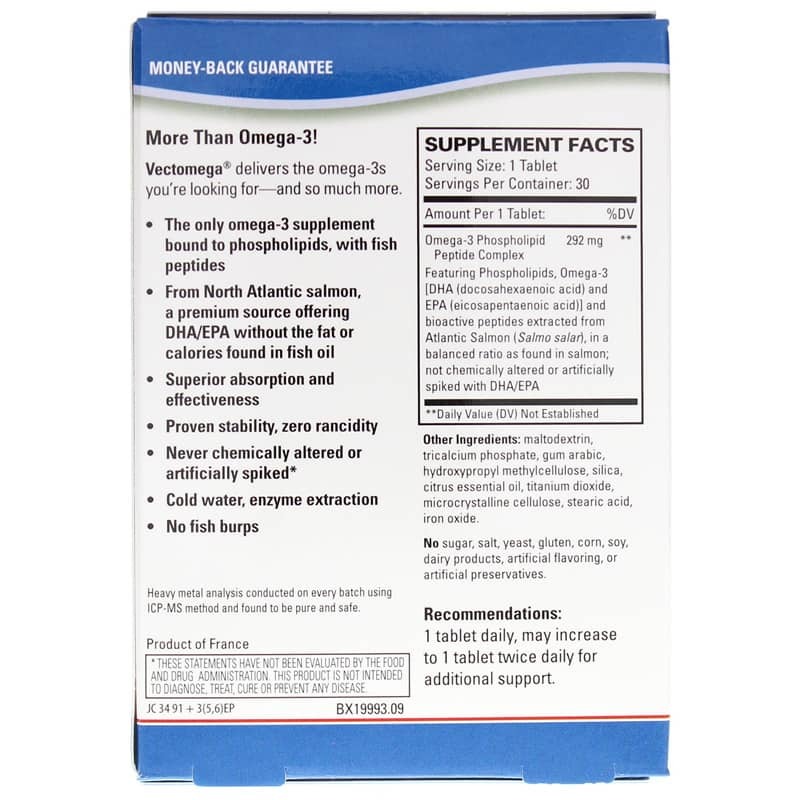 Vectomega from Terry Naturally contains whole food omega-3 fatty acids from salmon to help support heart and brain health. Vectomega contains DHA, EPA, phospholipids, and hydrolyzed peptides, or amino acids, from salmon extracted using a patented, chemical free process. According to the Council for Responsible Nutrition (CRN), all fish oil products have varying levels of PCBs, from trace to excessive. These toxic chemicals are concentrated in fish oil, which this product is not. Each batch of Vectomega is tested to pass both US and European standards for purity. This formula also has greatly increased absorption. Vectomega also contains heart-healthy bioactive peptides not found in krill, flax, or fish oil. To use as a dietary supplement, you can take two tablets a day for 30 days; then 1 per day thereafter. You may decide to continue with two a day for enhanced benefits. Other Ingredients: maltodextrin, tricalcium phosphate, cellulose, gum arabic, hydroxypropyl methylcellulose, silica, citrus essential oil, titanium dioxide, microcrystalline cellulose, stearic acid, iron oxide. Contains NO: sugar, salt, yeast, gluten, corn, soy, dairy products, artificial flavoring or preservatives. Adults: Take 1 tablet daily, may increase to 1 tablet twice daily for additional support. I was drawn to Vectomega because of the unique "one tablet" per day formula. I used to have to take 6 of my regular fish oil capsules to equal one tablet of Vectomega. I have been using this product now for three months and have noticed several benefits. Truly amazing product- I absolutely recommend to anyone looking for a good fish oil supplement! 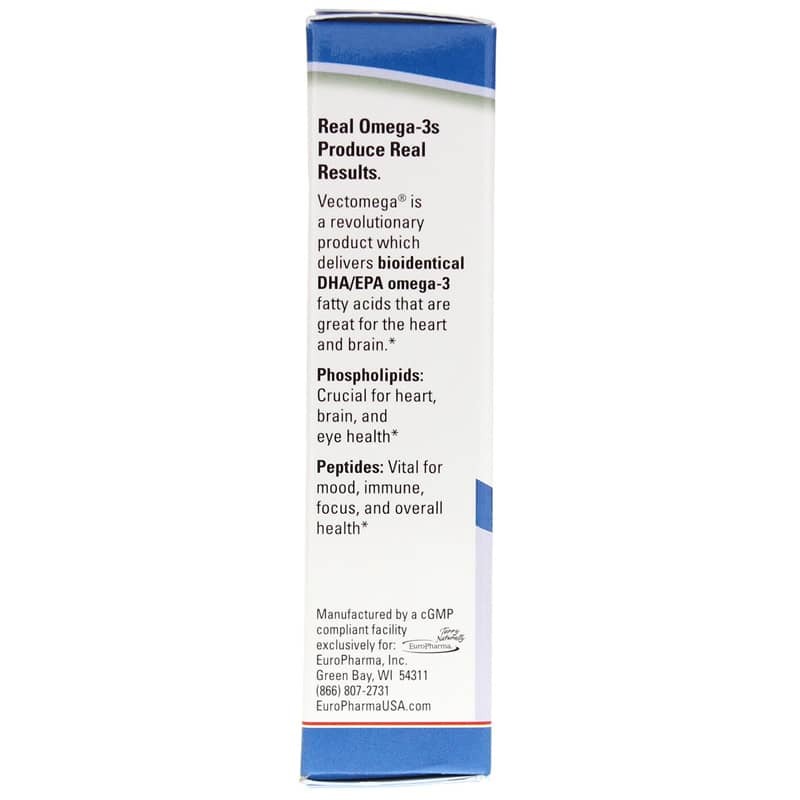 Take Vectomega for the Omega O.
I take one of these tablets each morning; I feel they have supported me I feel much stronger as an eighty year old equestrian (dressage rider). Natural Healthy Concepts had the product I wanted at a very competitive price, and ordering it online made the purchase very easy for me. I shall return! 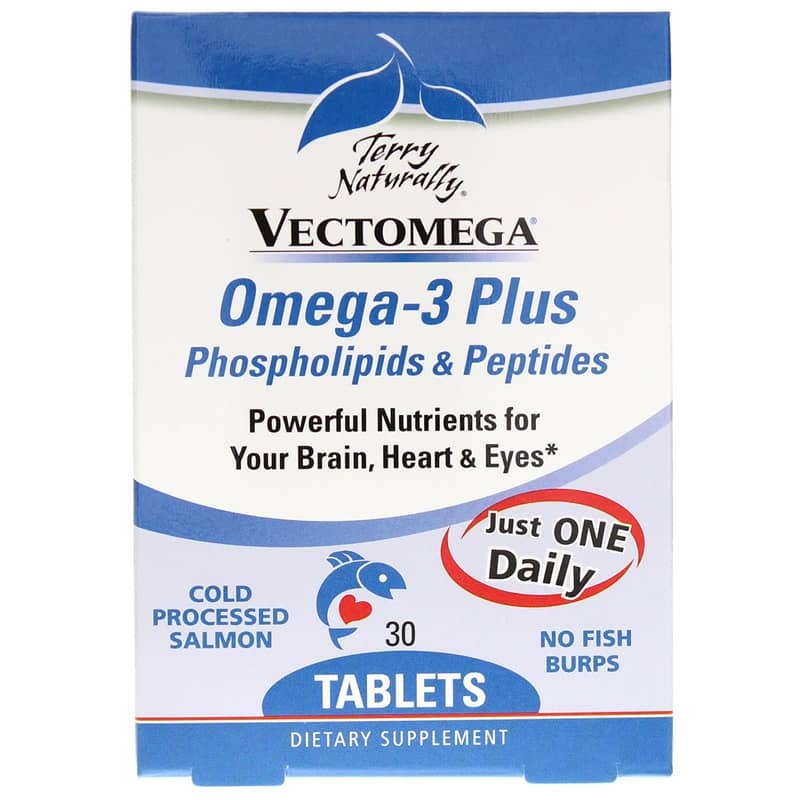 A friend introduced me to Vectomega Omega 3 Plus Phospholipids & Peptides, 60 Tablets, Terry Naturally. I thought I would try them and see if they would be helpful with reducing occasional joint pain. I have had little joint pain after 30 days of using them which has made it easier for me to exercise.